August 23, 1914 – Henry Korthagen, an unemployed painter, pays the 25-cent admission to the observatory of the Masonic Temple Building on State Street, crawls through a window to the northwest corner of the building and then jumps. His body strikes the crowded sidewalk on State Street at noon on a Saturday. A dentist on the twelfth floor of the building, Dr. A. Jay Blakie, sees the body fly past his window, with a black derby hat following 20 feet behind. “From my position above,” Blakie says, “the sidewalk looked like the surface of water after a stone has been thrown in. 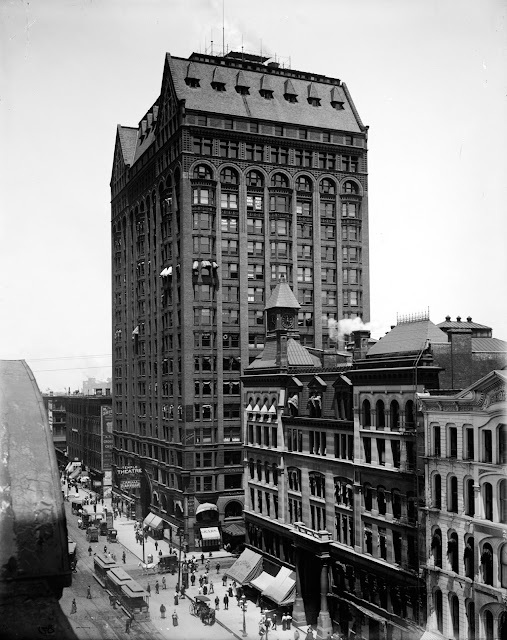 A circle of humanity just eddied back from the crumpled object in the middle of it.” [Chicago Daily Tribune, August 24, 1914] Korthagen had visited the Painters and Decorators District Council at 300 West Madison Street earlier, seeking to pay back dues and gain reinstatement to the union. Those at the union headquarters describe him as cheerful at the time. The observatory at the Masonic Temple is pictured above, all the way up there at the top of the building.